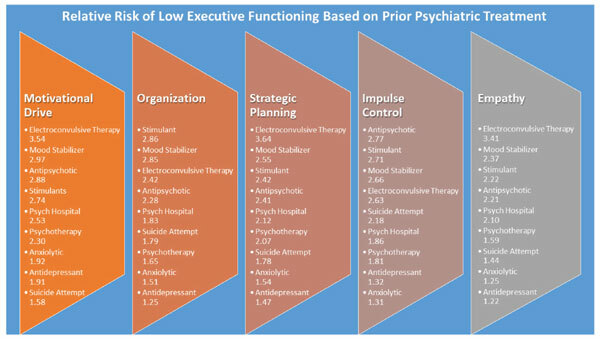 Objective: The present study provides the first published data documenting associations between self-reported executive functioning competencies and retrospective accounts of psychiatric medication usage. Background: Executive functioning competencies in planning, organizational skills, inhibitory control, selective attention, and optimal cognitive-set maintenance are essential to attain and sustain optimal problem-solving and goal pursuit. Executive functioning deficits have been observed with some regularity in the aftermath of major neurological or developmental traumas through the use of performance-based tests. However, executive functioning assessment research is being extended to self-report indices that measure perceived skill competencies associated with psychiatric conditions such as depression and attention disorders. Methods: A sample of national respondents (N = 595) was gathered through the use of Amazon's Mechanical Turk. Participants responded to the Executive Functioning Index (EFI) and a survey of psychiatric interventions. Results: Researchers found around a quarter of this national sample have relied on more than two of nine different psychiatric medications at some point during their lifetimes. Motivational drive seemed to have the greatest relative risk estimates (RR = 3.58) for all of the criterion variables. While gender differences in medication use were common, interactions with high risk executive functioning groups were rarely found. Conclusion: A longitudinal study examining the Executive Functioning-Symptom- Medication nexuses would be the next step in the understanding of how executive functioning deficits relates to psychiatric treatment including directionality and mediating factors. This area of executive functioning assessment has the potential to aid in prevention and earlier treatment to alleviate the intensity of symptoms that produce distress and impairment. Executive, functioning, psychiatric, medication, neuropsychology, self-report.